Q2 ION is currently one of the most lightweight and ultra-compact spark emission spectrometers on the market. The latest range of spark spectrometer Q2 ION reduces the complexities of metal analysis while increasing usability. 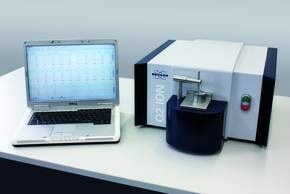 This multi-matrix system offers quality assurance of metal alloys and complete inspection of incoming material. The Q2 IONs main metal matrices and applications include metal fabricators, metal recycling and inspection companies, and aluminum, copper and iron at small-scale foundries. The Q2 ION is perfect for small to medium sized businesses, looking for an inexpensive spectrometer that is cheap to operate. Users can benefit from a dedicated workflow (as well as the traditional “analysis workflow”) for PMI (positive material identification), which is particularly effective at quality control metal alloys and testing incoming materials. By simply positioning the sample onto the spark stand and pressing the screen or pushing the start button, the user will receive a comprehensive elemental composition of their metal in under thirty seconds. The ClearSpectrum® and high-definition CCD detector ensures the highest quality analytical performance, and the patented Flat Field optical system offers optimal stability, and represents optics design at its finest. With its small, lightweight design, Q2 ION can be taken for analysis in local sites, and even rugged environments. Renowned for its remarkable analytical performance, the new Q2 ION range builds on this reputation with an increase in calibrations and elements and generally enhanced analytical performance. Bruker Elemental analyzers use the new soft- and hardware platform, Elemental.Suite, which is run by the controller of Q2 ION, and is supported by an SQL database and a Linux controller to guarantee performance and stability. The software has been applied to stationary applications, incorporating several features used on the Q4 MOBILE into the laboratory environment. The new Q2 ION boasts a formidable marriage of analytical performance and simplicity!